While meeting as a group with Franc and discussing the positives and negatives, what's working well/what's not of each, we were then able to narrow down even further to our most favored two designs (Erin's and Jason's). We discussed the importance of line quality, gesture, legibility as a logo/logotpye, and hierarchy as a means to further improve our designs. From there we each traded files of the two favored designs and have set off on our own to come up with individual solutions to further improve them for our next set of iterations, which we will assess as a group by Monday, Oct 25. 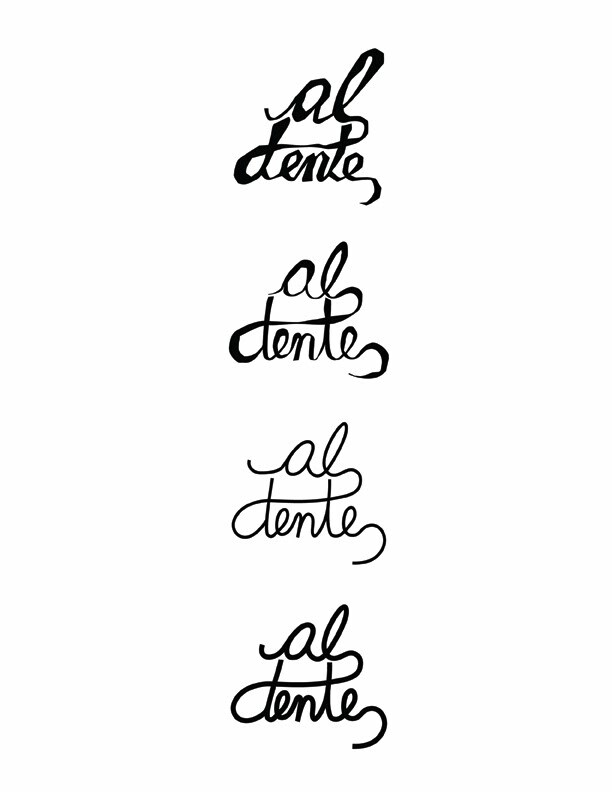 During this time we will individual play with our versions of each as a logotype and actual begin to distinguish placement and integration onto the label. 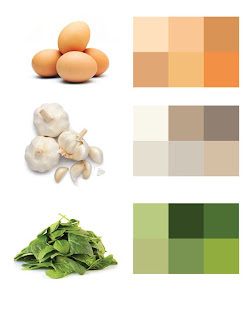 The color plate studies we have done will also play an important role in terms of the beginning designs for the label. This will be the introductory process to Phase 2 of our Visual Identity: Application. Today we had an in-class critique about our logos/logotype, labels, illustrations, and color schemes. Our group brought in everything we have done so far to get some feedback from the rest of the class. Here is what we brought in with the feedback we received from the other groups. ^ For the above logos, our classmates mentioned that they preferred the top two rather than the ones on the bottom because the top look more like pasta where as the bottom ones are too smooth and don't quite achieve the look and feel that we were going for. 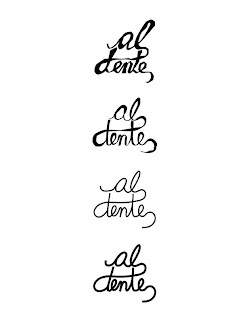 They thought the free flowing nature of the logo worked well and really captured the idea of Al Dente, the pasta as well as the company itself. 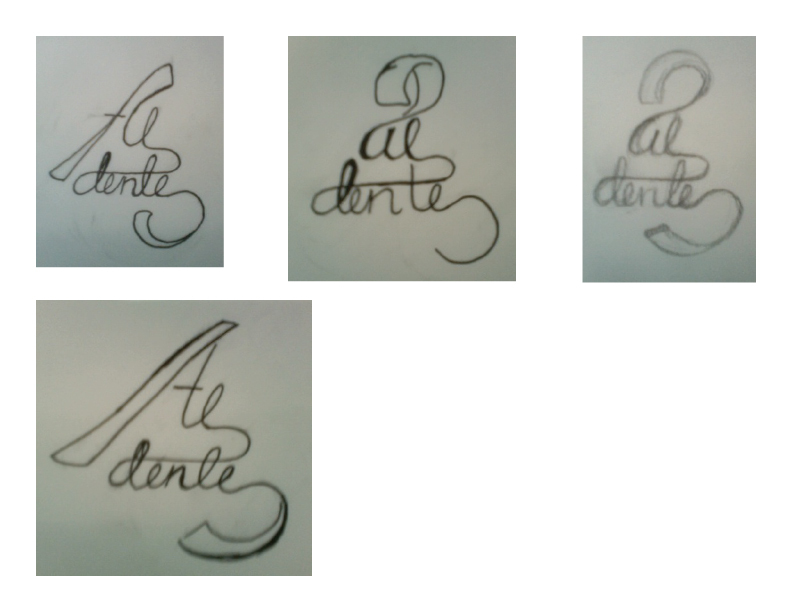 One thing they did suggest about the top ones were that they are a little too jagged and angular. They recommended working more on smoothing certain edges out in order to capture the look that we are trying to achieve. 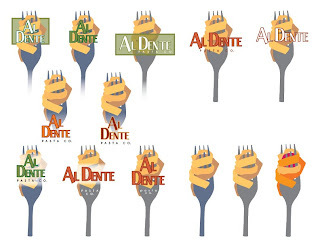 ^ Another concept we explored was using imagery of pasta wrapping around a fork. The class thought the imagery and colors were working very well but thought that the logo looked more like an identity for a restaurant and less than a logo for a pasta company. Another suggestion they had was to play around with the typeface a little bit. They felt that this one was a little static. ^ Here is another concept we brought in for critique. It explores the use of the pasta as image. It is also an exploration of what the pasta actually looks like. We saw that when we drew from memory, the shapes were looking more like ribbon than pasta. The class really appreciated the research into the characteristics of the actual pasta. They also suggested that we try working with different shapes due to the existing connotations of that specific ribbon configuration. We also received some positive feedback about our color studies and we look forward to referencing those as the project continues. This feedback was very helpful in seeing what is working and what isn't. We will use these comments as we start to narrow down our designs and focus on fleshing them out. Our goal for next class is to take what we have heard and focus on one or two of these designs. We are all going to work on creating more variations of these logos/logotypes in hopes our starting to begin finalizing a logo for this part of the process. This is fascinating to watch the progression. Thanks for posting guys!